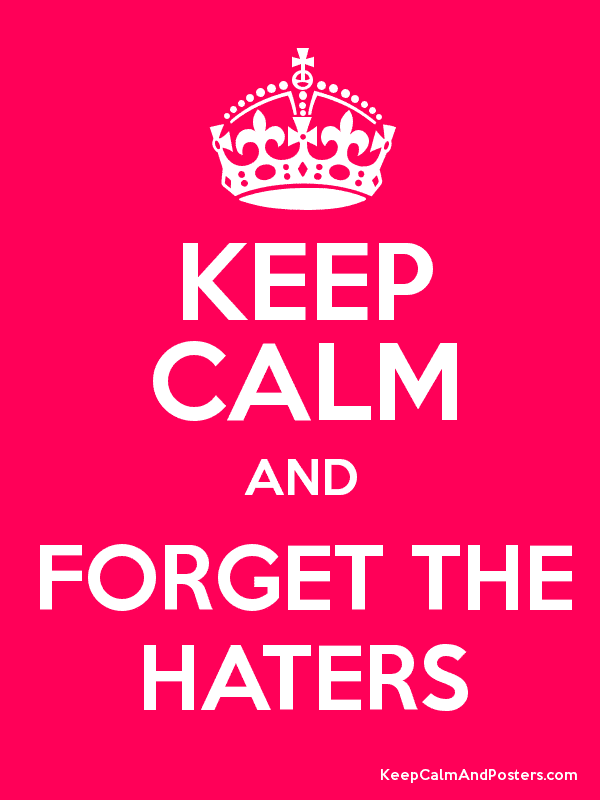 Haters: Never Let Them Bring You Down! Throughout my entire life I have known about at least a few people who did not like me at all. In the beginning I used to care…a lot. I wanted to be everybody’s friend, be invited to all parties, be Cher from Clueless! However, that was all until the magic of high school happened and a backbone was created, my dears! Yes, me caring what people thought about me became an absolute thing of the past! For example, I remember this one time in my creative writing course, I was in the process of writing one of my books that I was personally in love with! It was practically my baby! Now anybody who writes, paints, plays sports, or anything of the sort, knows that when you have done something that you have worked SO hard on doing that it automatically becomes your child. Anyways, so I bring my story in, so proud of my concept and my characters! Now what do these other ‘nobel prize winners,’ do? For startes, they ripped it to shreds, now criticism I can usually take, but, it was what the ring leader said after that almost forced me commit murder that very second! “Okay, who the hell wrote this crap?” When I tell you I was forced to walk out by my best friend at the time…you have no clue what was about to “go down”. It wasn’t until the next day when I had blasted my teachers for letting this happen that I had my eye-awakening experience. One of my favorite writing teachers took me to the side and was absolutely honest with me. He looked right into my eyes and said (we’ll call her Lacey) “Lacey is an idiot and your story was freaking fantastic. Don’t let a group of wannabe critics bring you down when you know somewhere inside of you that you are a great writer.” That is honestly where my backbone came in at full force and I just did not give a damn anymore. Now, I realize that out there, somewhere, I have a few people who have some not so great feelings about me and they continue to check my site daily to either talk about it or trash it. Well, all I have to say is you are doing a great job. Honestly, you are. You’re getting your feelings out there about me especially since I have seen none of you for either years or for some of you a few weeks. I’m so happy that I was a great attribute to your everyday conversation so that now since I’m not in your lives anymore, you need something else to talk about. So you chose The Young Shopaholic where every click into every post I make gets accounted for and just increases my views and popularity. So, I thank you for the opportunity of choosing me to be your fountain of hater-ade. If you know that somebody is talking about you behind your back and smiles in your face, just smile back and act like you know nothing. Do not tell them anything that goes on in your life no matter how hard they pry. That person will show their true colors eventually. 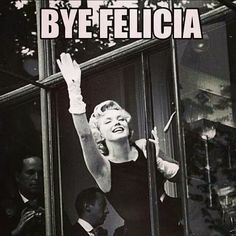 When the ‘hating’ is brought into light and this person throws everything in your face that you have ever told them, don’t be the old me that would probably pull a Rhonda Rousey on them, just do the mature thing. MATURE THING: just laugh and agree with everything that person says, those words did at one point come out of your mouth. It doesn’t matter whether or not it was something bad you may have done, just swallow your anger for the time being. Let it be known aloud to this person that they are a terrible friend and everytime they get dressed it must be in the dark. Just leave it at that. So, do not worry about what anybody thinks about you. Don’t worry about fake friends, haters, or people that just do not like you for no good reason. Just live your life, keep your head up, and smile. Nobody is worth an ounce of your emotions, especially the bad ones. Also, remember this great phrase, ‘haters gonna hate.’ Have you ever experienced the wonderful world of ‘haters?’ Do you have any advice? Maybe a similar story? Leave a comment below with your experience or any questions/comments! Plus, answer the poll below if you’re as curious as I am to see how many people actually experience ‘hating’. Have some feedback on this article? Next Ask The Young Shopaholic: My Crush Isn’t Answering Me Anymore! Love this post too. All those haters, I say kill them with kindness. Keep up the great work Amanda! !